The Summer’s coming and there is officially no reason in the world why we now can’t justify spending our hard earned magic beans on swooshy frocks that make us feel like we’re 10 again at a fairy picnic. With no cares in the world. And no homework to do either. I’m a sucker for pretty dresses. And this one’s a corker. 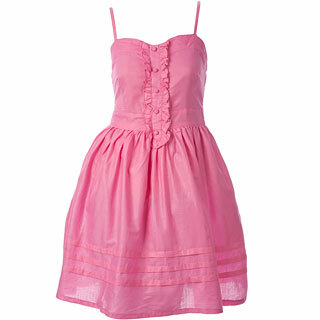 A lightweight cotton sundress in blush pink from the clever people at Joy is making my heart go a flutter. A voluminous skirt, dinkydoo buttons and ribbon trim make this a little piece of heaven. There’s more – it comes in 3 other colours: ivory, navy and sunshine yellow. Yep. The best bit? It’s on sale and has been slashed to a mere £21. Aww it’s soo pretty! I wish Joy hadn’t closed down in Birmingham…online shopping just isn’the same!